When I dove into collecting baseball cards at about ten years old, I collected everything I could get my hands on. There were nearly as many oddball sets as there are parallel sets today, and I grabbed as much as I could. Here are a few of the offerings that bore the Topps name. These cards did not come in packs. You had to collect a certain number of “offer cards” from regular packs, then send them in along with postage to receive them. I never did order them directly from Topps but picked up a few in trades. Before baseball-reference.com, we relied on baseball cards stats to know who the best players were. In 1986, Topps issued a set of mini “League Leaders.” The back of this card reveals that Mario Soto finished the 1985 season second in the National League with 214 strikeouts, tied for 6th in games started, tied for 6th in complete games, and 7th in innings pitched. Baseball card companies partnered with food products often in the olden days. Post Cereal, Kellogg’s, and Kraft Macaroni and Cheese were just a handful of the food products that featured cards in products. 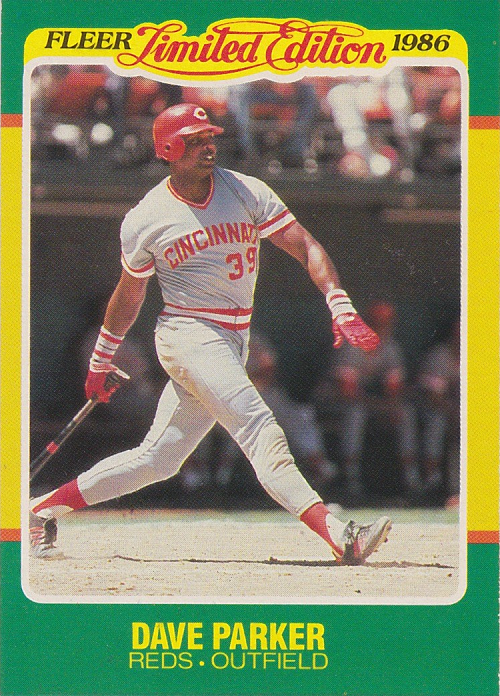 Quaker Chewy Granola bars was another, and Dave Parker was one of the more common Reds players to show up in these sets from 1985-1988. These cards are usually found in very good condition, so I assume they were available through mail-order rather than included in the box itself. Topps Tattoos were sold in packs, but I don’t recall ever seeing them in stores. I picked up a few featuring Reds players through trades. 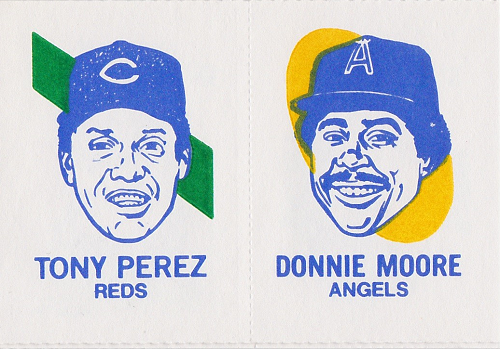 The full sheets featured several players; this particular sheet included not only Tony Perez, but fellow Hall of Famer Ozzie Smith and a player with one of the greatest nicknames in the history of baseball: Dennis “Oil Can” Boyd. Right next to Perez is the late Donnie Moore, who tragically took his own life in 1989. I’m so used to seeing them reversed, flipping it just looks weird. Are O-Pee-Chee cards oddballs? Sold in packs in Canada, but singles always traveled south and into the hands of American kids. I loved cards like this Bill Gullickson, showing the original Topps photo but new team designation. Four times Mario Soto finished in the top ten voting for the Cy Young Award. In 1983, he came in second behind Philadelphia’s John Denny. He was named to the NL All-Star team three times and started the game in 1983. 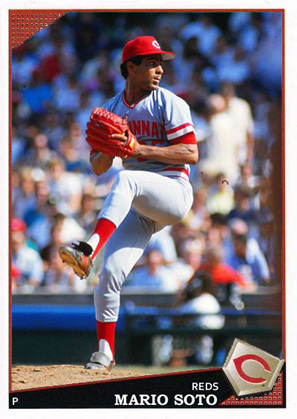 In the early 1980s, Soto was probably the best thing the Reds had going for them. 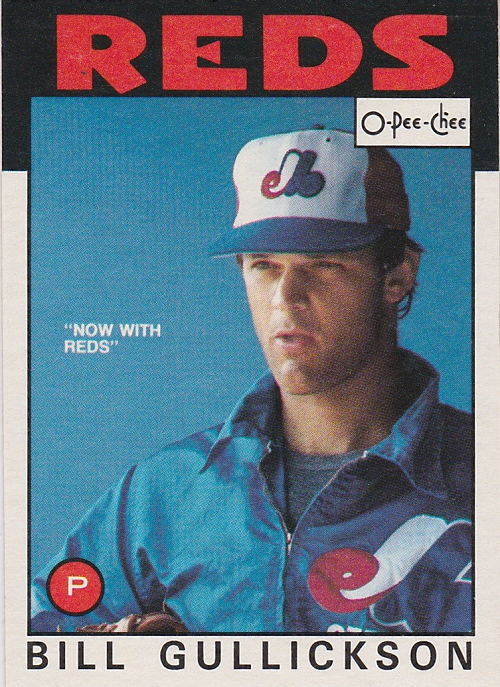 In 1982, his record was 14-13, but had the second highest WAR for pitchers in the National League (behind Steve Rogers of the Expos), and tied (with Rogers) for the third best WAR in the NL behind Montreal’s Gary Carter and Andre Dawson. I’ll be the first to admit that I don’t really understand WAR, but I’ll use it when it supports one of my favorite players! As far as I can tell, Soto has never been included in any officially licensed released since 1989, when Score issued a card showing him wearing the Dodger blue (though he never pitched a regular season game for them). He was included in a deck of playing cards released by Hero Decks a few years ago; other than that the Soto well is dry. How about it, Topps? How about some love for one of the best pitchers in the early 1980s? Internet commerce sure has come a long way, hasn’t it? I’ve used eBay for years, but when it comes to trading cards and lower-end product, there are other options that are more cost effective than eBay. Last week I purchased cards from three different sellers on sportlots.com, and the first package arrived today. Dave Concepcion, Dave Parker, Mario Soto, Pete Rose. Four names that Reds fans revered in the 1980s. 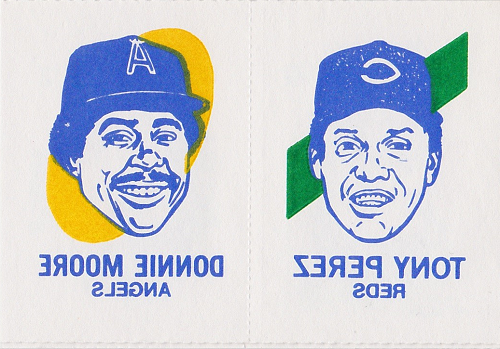 The Concepcion and Parker are 1987 Red Foley stickers. I have never seen these before, so wasn’t really sure what to expect. Kinda boring, and really too small if you ask me. The Soto is a 1986 Fleer Mini. I swear I’ve seen it before, and if it is stuck behind another card in the binder I might be a little upset that I wasted eighteen cents on it. 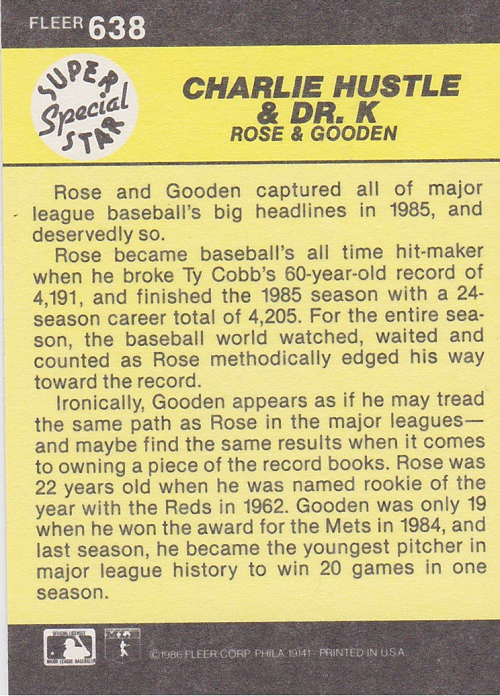 The Rose is from the 1986 O-Pee-Chee set, card #1 in the issue. 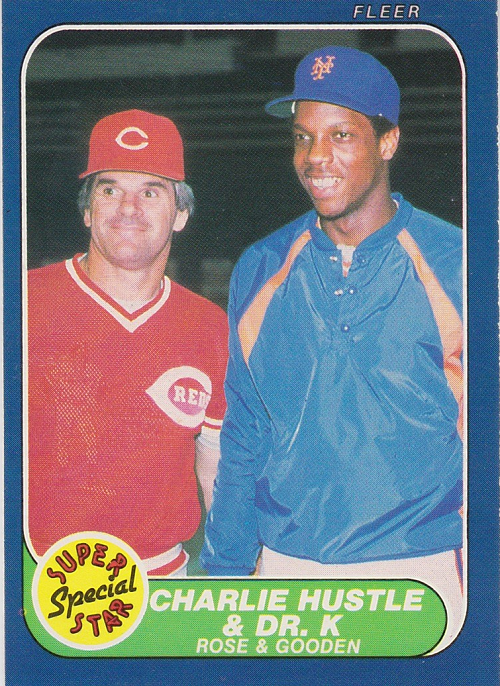 I am now only one card away from owning all the Reds cards from ’86 OPC, I think, and that should be arriving in one of the other packages. I can’t wait to see the cards in the other two packages when they arrive this week! Jim over at The Phillies Room makes some awesome custom cards, and has for several years now. He calls them “Chachi” sets, and I always look forward to seeing new customs on his site. We recently agreed to a Phillies-for-Reds trade, and his package arrived in the mail today. My jaw almost hit the floor when I saw the goodies he picked out for me! My collection of 1971 Topps Reds has increased a lot over the past few weeks, with great cards coming in from thoughtful bloggers. Pat Corrales is now the seventh Reds card I have from the 1971 set. This 1979 Topps card commemorates Pete Rose‘s 44-game hitting streak, still a National League record. I don’t recall ever seeing a 1995 Topps Embossed card, so this Bret Boone was a very cool addition to my collection. From the 2011 Topps set, I got both Johnny Cueto and Frank Robinson 60YOT backs, and a base card of Aaron Harang. Thanks for the trade Jim. Awesome stuff! When I started collecting baseball cards again a few years ago, I was very unfocused. I bought a little of this, a little of that. Over the past couple of years, I started refining my habits. 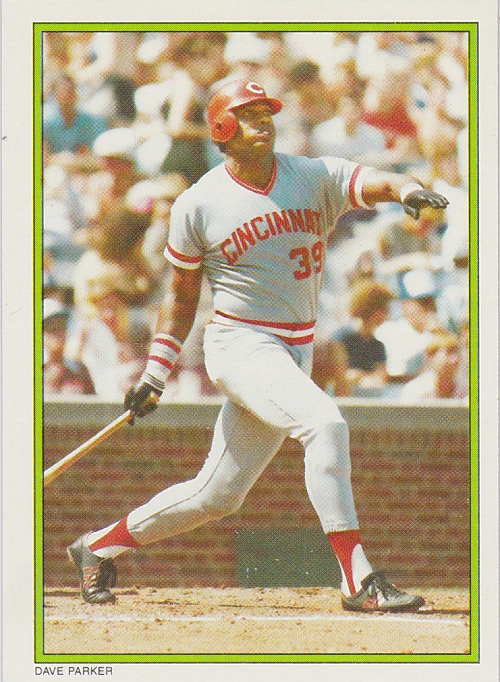 I wanted Reds cards in general, and a few players in particular: Mario Soto, Kurt Stillwell, Chris Sabo, Shawon Dunston, Rob Dibble, Ken Griffey (both Sr. & Jr.), Pete Rose, and Eric Davis. I got to thinking yesterday…why in the world do I need two of every Mario Soto card, except 1989 Score? 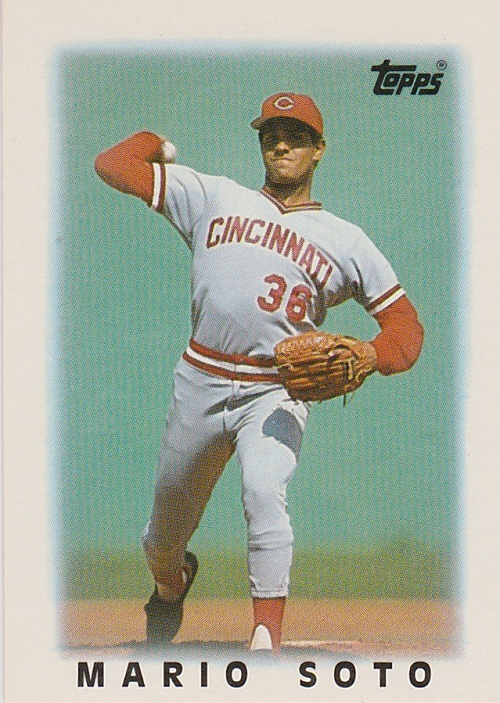 Why do I need doubles of every Eric Davis Cincinnati card? I think I’m going to discontinue my player collections of players who spent a majority of their careers with the Reds. I will still gladly accept Sabo Orioles cards, Dibble Brewers cards (of which I have none), Griffey Mariners cards, and Rose Phillies cards. Add to that Geronimo Royals, Foster Mets, Morgan Astros, Rijo A’s, Esasky Red Sox, Kluszewski White Sox, Parker Pirates…you get the point. I won’t turn them away. I am going to continue (and maybe put a little more effort into) my pages for Stillwell, since he left the Reds early in his career, and Dunston, who never played for my hometown team. If you are interested in the checklists that I have posted for Davis, Soto, Sabo, Senior Griffey, or Dibble, copy and paste them into your own text document now as they will be deleted in the coming days. 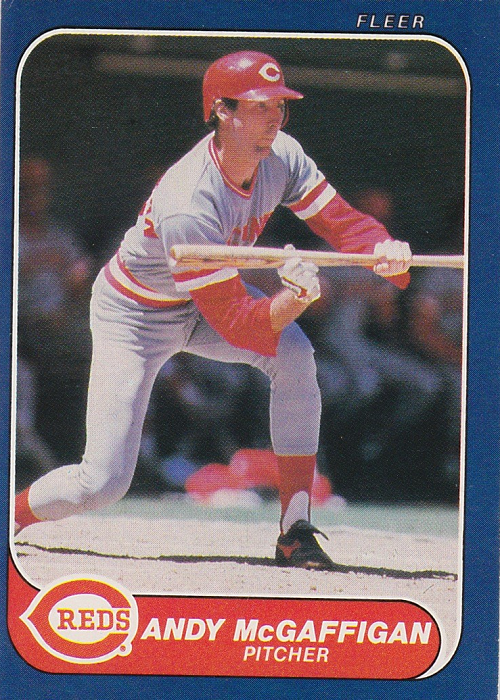 I am going to absorb to Reds cards into my Reds collection and start a new binder of Reds wearing other teams’ uniforms. John of Johngy’s Beat said he would like to see a “virtual” 2009 Topps card of Bill Plummer, former backup catcher for the Redlegs. I made two, and as payment for services (?) rendered, he sent me the 1985 Donruss Mario Soto Diamond Kings card. Thank you, Night Owl for the suggestion. Thank you, Johngy’s Beat for the card! When Night Owl speaks, I tend to listen. He says do it, I do it. My wantlists are in an awful, unorganized, unupdated, unmaintained mess, so it only makes sense. I don’t have much to offer in return, but if you make an offer I will listen and will do my best to fulfill your request. I don’t know how difficult these cards are to obtain, as I have not really actively sought most of them, nor do I know what their “book value” is as I don’t really pay attention to “the book.” So just let me know what you’re looking for, or what you want in return, and we’ll see if we can work something out. I’m going to try to stay awake now for another hour. 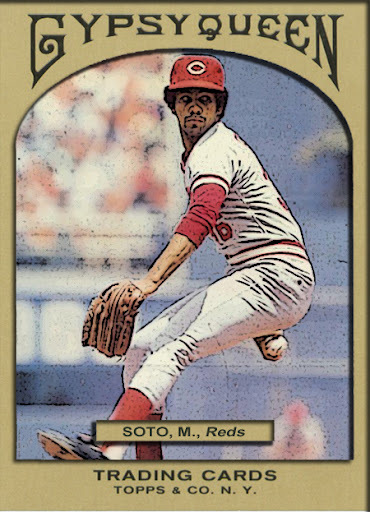 My favorite pitcher to ever pitch for the Reds, Mario Soto was a force to be reckoned with in the early 1980s. 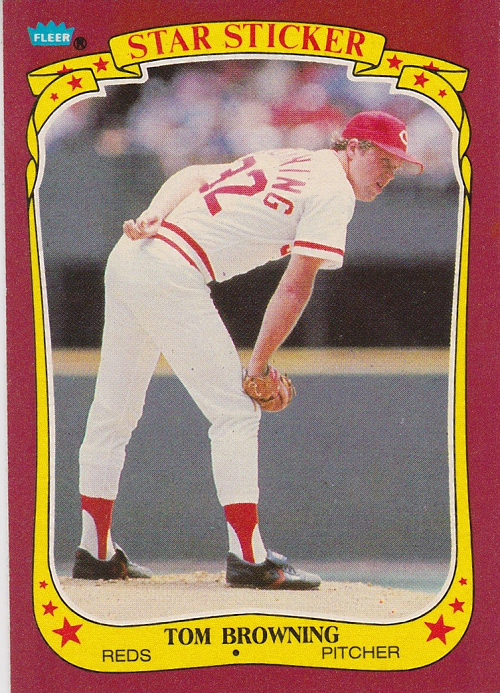 Four times he finished in the top ten for Cy Young voting, coming in second behind John Denny in 1983. 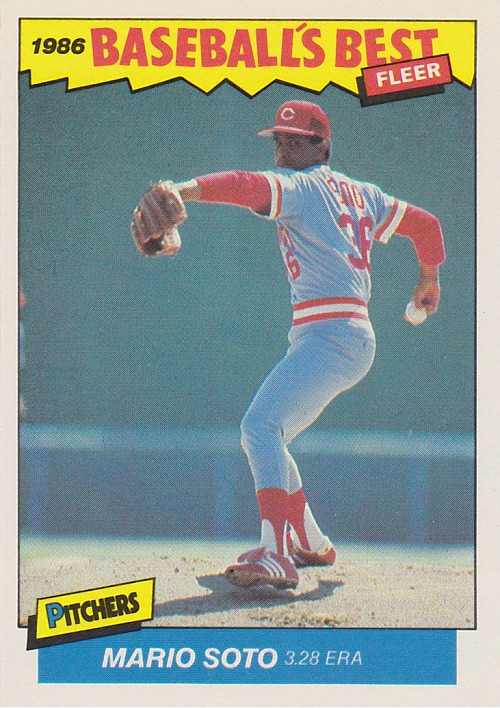 Soto could have been a 20-game winner that year if he had an offense behind him, but the Reds were pretty terrible in ’83. In 1983 and 1984, Soto led the NL in complete games, a foreign concept to pitchers today. 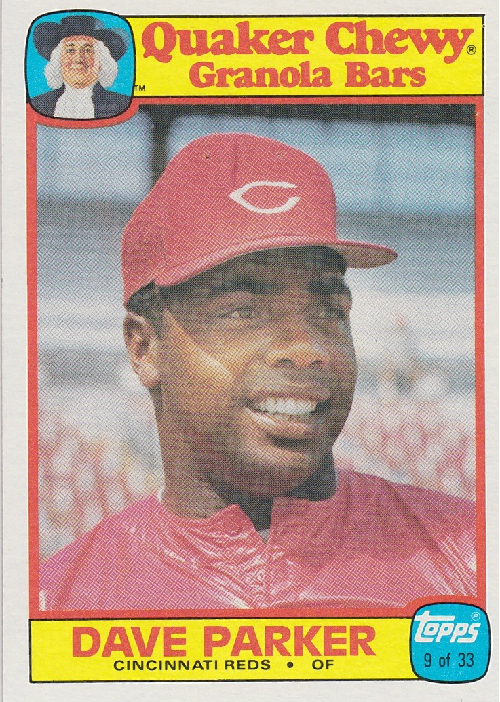 A three-time All-Star (including a start in 1983), Soto won 100 games over his 12-year career for the Reds. I’ve had the honor of meeting Soto and getting his autograph at the past two Redsfest events. You might remember that in 1989 Soto was featured in a Dodgers uniform in the Score set. Though he never faced a batter during a regular-season game for the evil blue ones, he was traded halfway through the 1988 season to LA. A similar thing happened in 1995 when Jack Morris was pictured in a Reds uniform, having never played a game that counts for Cincinnati. Soto was inducted into the Reds Hall of Fame in 2001. One more card to go and I’ll be done with the 2009 Topps Reds “fun cards.” Anyone care to guess who the subject of that card will be?